Have you ever experienced that having a word or sentence written on your desk or on the wall in your office tempts you every time you see it to read it? Well, I certainly have. There is so much rubbish stuck in my head this way. However this habit can be used to your advantage. When I had to learn French quickly I wrote the words of everyday items on post-it notes and stuck them on the actual objects. Needless to say it worked wonders with my progress in learning the words. With this in mind, I have designed some everyday objects, accessories and home decor items with positive affirmations. Yes, the affirmations are very short, but they do the job. How they work? They hijack your thoughts, redirect them from negative to positive ones. Focusing on the positive changes your energy, your frequency. The higher the better. And there is more. Every single energy centre in your body resonates with a certain frequency of colour. The Heart Chakra vibrates with Pink. I also incorporated Peach, as it has an uplifting effect. If you feel sad, depressed it cheers you up. So when you look at my artwork you subconsciously soak up the colour energies. You are also reminded that you are not alone. You can call on your Guardian angel any time. I had an interesting conversation the other day with a man, who receives messages through colours from the Universe (his guides). He said that he also sees a guide or angel for every single chakra separately. What I have done here is very similar. I have created an angel for each chakra, so you can feel you are supported, when you look at the picture. Your guardian angel is always with you. You just need to call upon him/her to help you with your issues. Do you need to be reminded from time to time that you are enough? It’s not a problem any more. 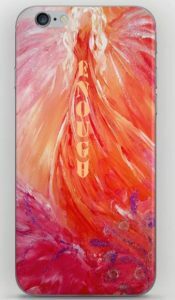 Have an iPhone case with my Angel of Love artwork, accompanied by the word enough. Why stop there? 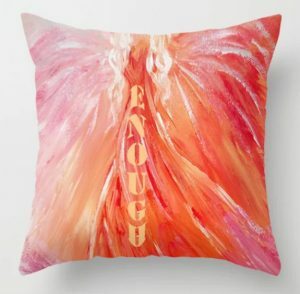 You could have a throw pillow for your home, a tote bag for shopping, a bath mat for your bathroom, etc. Not looking for a case, but want to customize your phone with rad designs? All you need is an iPhone Skin – a vinyl decal which sticks perfectly to your model. Pick up a few and change them out – they’re super easy to stick on and take off. Elevate any outside space with Outdoor Throw Pillows. Crafted with weather-resistant fabric that prevents your design from fading, and lined with polyfill to make sure they keep their shape. This artwork is available in many different forms. 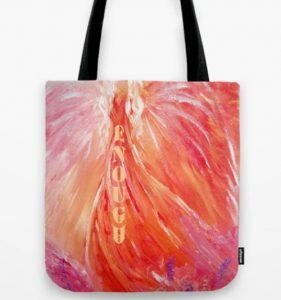 Go check them out in my Society6 Shop.